Billed as “the world’s most realistic teaching tool,” the six manikins created by Lifecast Body Simulation provide an incredible level of realism – full range of motion and joint articulation, real human hair and details such as veins, age spots and even removable dentures – that creates the illusion of treating real patients for RCC students training to become EMTs and paramedics. 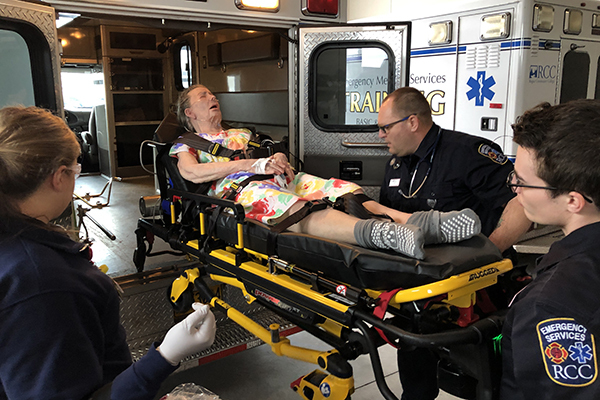 “I sincerely believe that the power and impact of this quality of simulation-based training makes it feel like a real patient encounter,” said Gary Heigel, chair of the RCC Emergency Services department. RCC Emergency Services students train with a lifelike manikin created by Lifecast Body Simulation. High-fidelity patient simulation (HPS) uses a variety of tools to simulate real-life scenarios. It aids development of clinical judgment, teaching students about complex clinical situations that play out like real life. HPS allows students to acquire and develop critical-thinking and decision-making skills without exposing patients to unnecessary risk. “Powerful learning happens when the student experiences a visceral and emotional engagement in the situation, and simple things can increase the realism dramatically,” Heigel said. His department has been moving away from lecture-based classes to a more hands-on learning environment. Many scenarios still require real people as role-players, but the manikins provide extensive training possibilities. 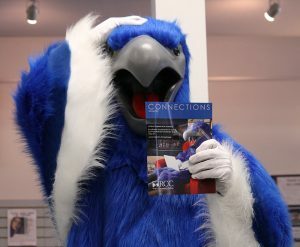 “We have seen dramatic improvements in student performance with the more hands-on approach, and I am excited to take that process to the next level with the addition of these manikins,” Heigel said. Not all manikins are created equal, and the Emergency Services department spent four years selecting the best possible product. The Lifecast manikins are a unique combination of silicones and proprietary mixtures that create the most realistic looking and feeling medical training simulators ever produced. They also allow for realistic movement, realistic CPR practice, advanced airway procedures, and IV access. “These manikins, when combined with the iSimulate monitor simulation tools we already have, will allow us to provide real-time and realistic feedback to students, similar to what is accomplished with other high-tech manikins, but in a much more realistic and impactful way,” Heigel said. RCC’s new family of manikins includes a premature infant (with umbilical cord still attached), a newborn infant, a 3-year-old male, a 9-year-old female, a 50-year-old male and an 81-year-old female. “This gives us the ability to simulate a huge variety of medical and trauma emergencies involving a wide range of patients,” Heigel said. Purchased from Echo Healthcare, the cost for the manikins ranged from $7,500 to $18,500. The entire purchase, just under $75,000, was funded by the Morris Family Foundation, which helps support technical education opportunities for Jackson County students. • Emergency Medical Services programs at RCC, visit roguecc.edu/ems. • Lifecast manikins, visit www.echo.healthcare. • The Morris Family Foundation, visit morrisfamilyfoundation.weebly.com.